This event is free and open to the community. Registration is optional but recommended. Visit udel.edu/nationalagenda for details. The CPC's eighth annual National Agenda program focuses on all things related to the midterm elections. The Midterm Matters speaker series looks at how campaign strategy, news coverage, polling, and election cybersecurity affect midterm elections and why civic engagement is important. This program is supported by the University of Delaware Office of the Provost. 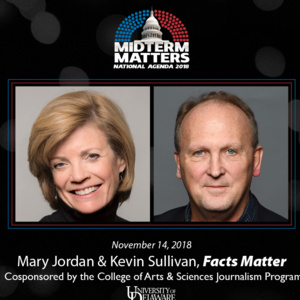 Washington Post Pulitzer Prize-winning journalists Mary Jordan, a national political correspondent, and Kevin Sullivan, a senior correspondent for national and international affairs, reflect on the midterm election results. Jordan spent 14 years abroad as a foreign correspondent and Washington Post co-bureau chief in Tokyo, Mexico City, and London. She has written from more than 40 countries. Sullivan was a foreign correspondent for 14 years, then served as the chief foreign correspondent, deputy foreign editor, and Sunday features editor. He has reported from more than 75 countries on six continents. Jordan and Sullivan won the 2003 Pulitzer Prize for International Reporting for their investigation of the Mexican justice system. Jordan and her husband Sullivan have also co-authored two books. Register to vote and get reminders about upcoming elections at udel.edu/turbovote.org. Visit cpc.udel.edu/makeitcount to learn more about voter engagement at UD.